Here's my card for the current Merry Monday challenge - The Words Have It (make your sentiment the focus of your card). This will be one of the designs for my Church Christmas project, so it has to be easy to duplicate. I whipped up 28 of these on Friday evening. 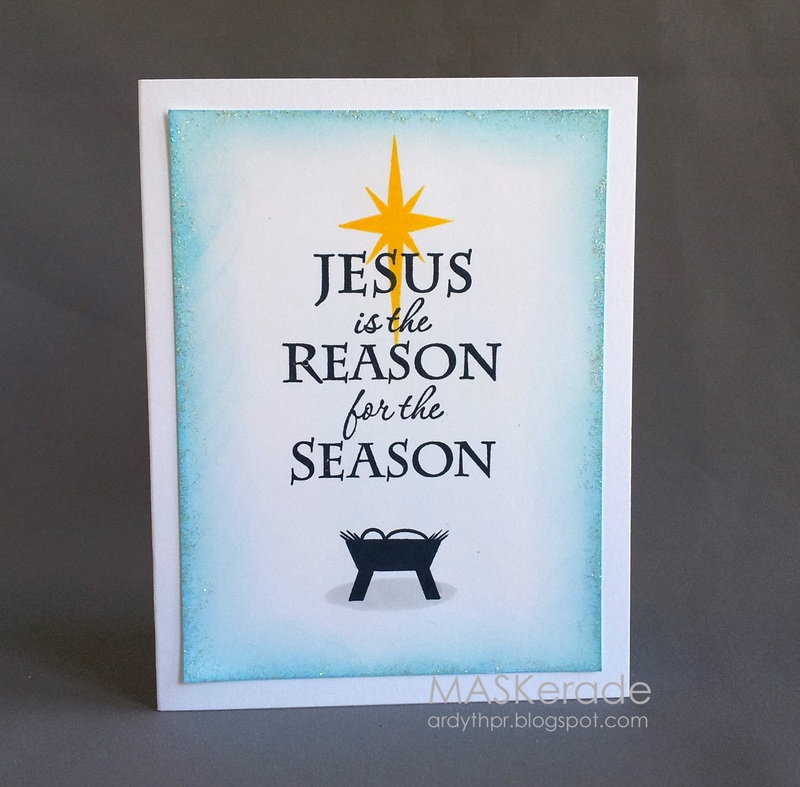 I used a Stampabilities sentiment (can't find a link, but I probably got it at Hobby Lobby), Market Street Stamps (no longer with us) manger, Paper Smooches shadow and Gina K Star. To add a bit of interest, I edged the panel with Tumbled Glass ink and then smeared Stickles for texture and sparkle. Perfection Ardyth. I love your placement of your star. This is awesome, Ardyth! So perfect for Christmas. Thank you so much for sharing with us at Merry Monday! Great way to highlight the sentiment and the placement of the star! Whaaat! 28 cards in one evening - genius! Beautiful card. love the sparkle of the border!! This is CAS perfection, Ardyth! The best sentiment for Christmas! Thanks for sharing it with us at Merry Monday! Fabulous sentiment, Ardyth! Love the simple design. Thanks so much for playing with us at Merry Monday! Inkings not like you but I love it. The star and the inked edges really highlight the beautiful sentiment, Ardyth. This is a lovely card. So pretty! I love the sentiment and inked border. Love the glittery edges and pop of yellow! Another 'brilliant idea' to add a bit of glitter to the pretty sponged edges of the card! And, can that wee shadow oval be any more perfect than it is? I'm thinkin' not.